Here we are again with a new Fantasia for Solo Flute. This is No. 8, and it's in the key of E minor. It starts off with a slow, elegant Allemande full of large intervals. You will also find some rarely-heard chromatic lines, which give a very peculiar character to this movement. Rameau once wrote that the key of E minor is never merry, even in an allegro. His remark is certainly apt here: the central Spirituoso is way too agitated to be considered happy. 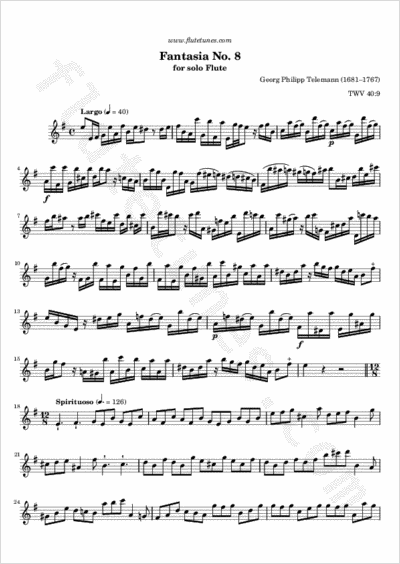 The last movement is in the style of a Polonaise, a Polish dance in which the second beat should be played softer than the first one, and the third beat should gently lead to the next measure.